recolectada en la zona Habana- Matanzas. Foto: Aloyma Semidey..
Meristiella schrammii (P.Crouan & H.Crouan) D.P.Cheney & P.W.Gabrielson recolectada en la zona Habana- Matanzas. Foto: Aloyma Semidey. Published in: Gabrielson, P.W. & Cheney, D.P. (1987). 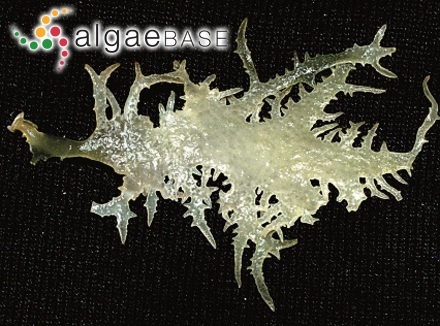 Morphology and taxonomy of Meristiella gen nov. (Solieriaceae, Rhodophyta). Journal of Phycology 23: 481-493. 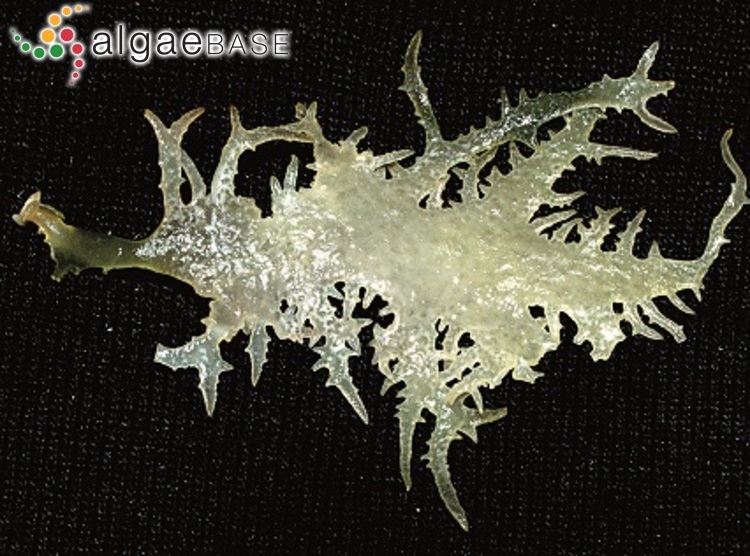 The type species (holotype) of the genus Meristiella is Meristiella gelidium (J.Agardh) D.P.Cheney & P.W.Gabrielson. Lectotype locality: Guadeloupe, Moule (Gabrielson & Cheney 1987: 483). Lectotype: LD 34680 (Gabrielson & Cheney 1987: 483). Notes: Lectotype (Cheyney). Isolectotype: Moule, Crouan # 138, (in BM). Cheyney (1988: 217) gives the following data: Type locality: Guadeloupe: Crosier (Point Lavadare) and Moule, January and April, Mazé Coll. no 138, 1st series 1609; Lectotype: Herbarium Agardh 34680 (LD); isotypes: BM, P.
Faye, E.J., Shimada, S., Kogame, K. & Masuda, M. (2004). A new red algal species Meristotheca dakarensis (Solieriaceae, Gigartinales) from Senegal, western Africa, with comments on the relegation of Meristiella Cheney to synonymy with Meristotheca J.Agardh. Cryptogamie Algologie 25: 241-259. Accesses: This record has been accessed by users 495 times since it was created.